"When You're Ready for Something Bigger..."
The Ashby® is designed to be the world's ultimate broadhead. In 2007, we began talking with Dr. Ed Ashby about making what he considered the ultimate big and dangerous game broadhead. After years of testing and reporting, he had his list of mandatory design aspects he felt the ultimate broadhead needed. We took that list and for 18 months we engineered, tested, and redesigned until we got it right. The Ashby broadhead has earned the Gold Standard among the world's top PH's, guides, outfitters and traveling bowhunters by compiling an unmatched record of performance. To date, bowhunters have reported our Ashby broadheads have successfully harvested 75+ elephant and 1,000+ Cape/Asiatic buffalo. The Ashby is a one-piece broadhead, 1.13" x 3.52", forged from a solid piece of 440C stainless steel. There are no weak points. Of course they offer our signature bone busting tanto tip. All edges, including the trailing edge are honed razor sharp at the factory. Caution: Use only GrizzlyStik tapered carbon arrows with GrizzlyStik forged broadheads. Using parallel carbon arrows, especially thin diameter carbon arrows using Easton's HIT inserts may result in arrow failure. 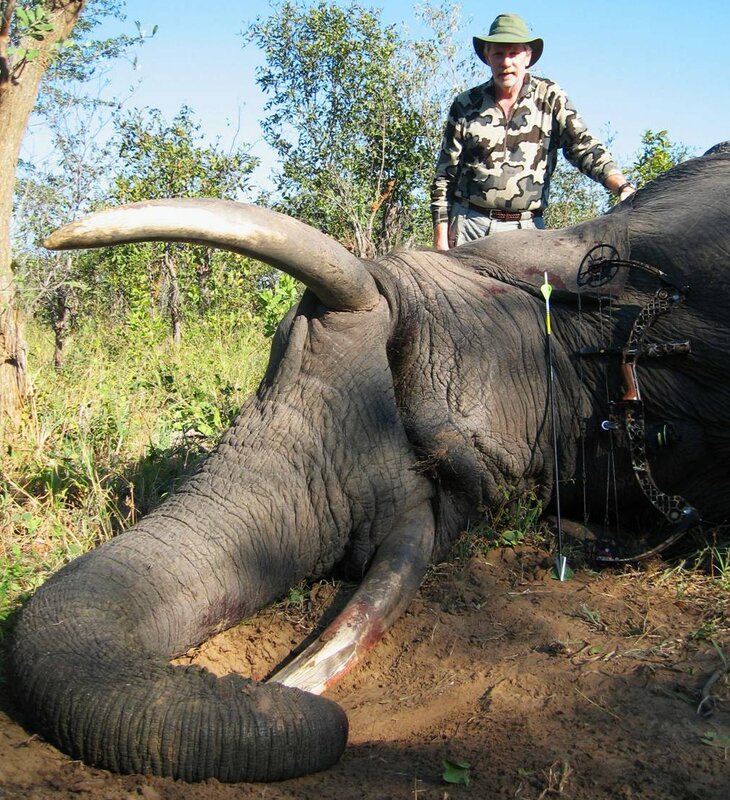 Niel Summers of Bowhunting Safari Consultants with his Jumbo. Mr. Summers used a GrizzlyStik Arrow and Ashby broadhead system for his one arrrow harvest. Total arrow weight was 1250 grains and had a 29.5% FOC. Lethal arrow penetration with high FOC GrizzlyStik arrow and Ashby broadhead. 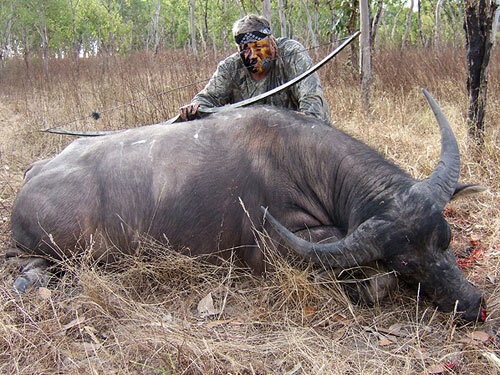 950 grain - 28% FOC Momentum arrow and Ashby Broadhead - "Full Pump Job"
Dr. Ashby with a big Asiatic water buffalo taken with a prototype Ashby broadhead. design a broadhead for when everything goes wrong." "If it works on these brutes, a whitetail will be a piece of cake." Disclaimer! 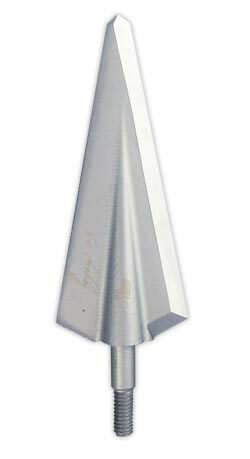 Dr. Ed Ashby graciously allowed us to use his name on this broadhead with one condition. He insisted that we make it clear to our customers that he receives no compensation for the use of his name on our broadhead whatsoever. His goal is to educate the world on what kinds of arrows and broadheads best penetrate big game animals. He receives no compensation for any of his research but shares the results freely. He wants to educate bowhunters everywhere on what works best on big game animals so the animals may be harvested in the most efficient manner possible. It's actually more about the animal than the bowhunter. We all owe a great debt to Dr. Ashby for his significant contribution to bowhunting. From all of us at GrizzlyStik, Thank-You Dr. Ed Ashby!